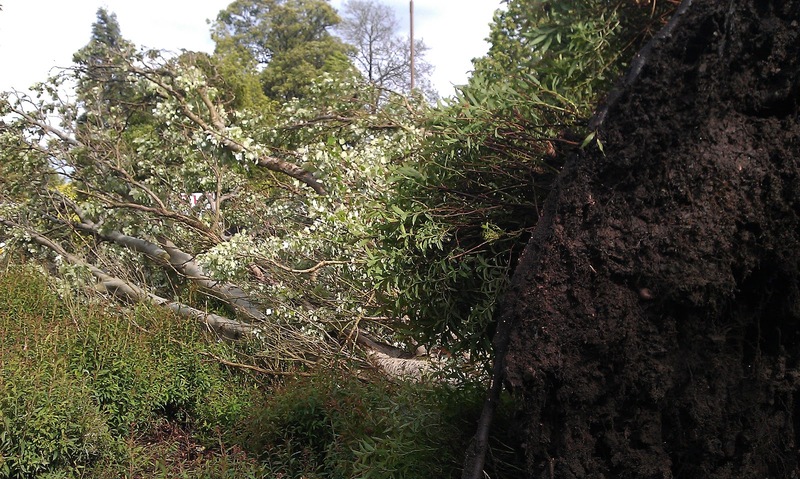 Today saw relatively unprecedented weather conditions for Scotland in May. 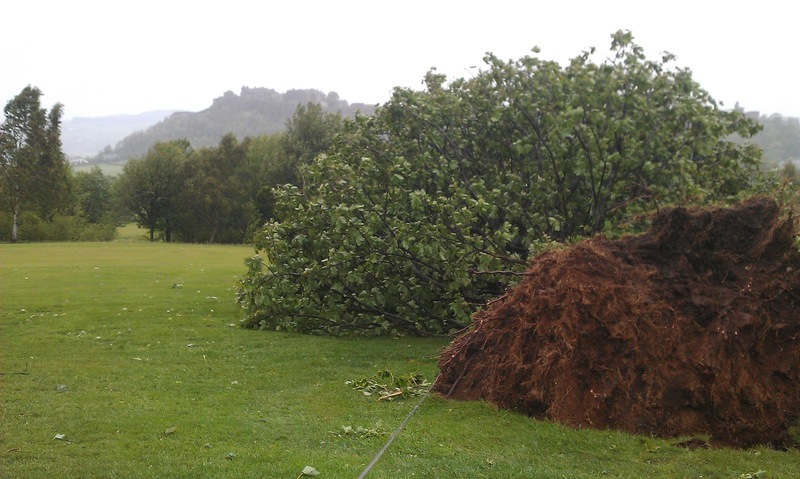 Usually a month of increasing temperatures, sunny weather and generally altogether pleasant conditions, May 2011 has seen unsettled, wet weather, despite a glorious and hot few weeks in April. Today, as forecast by the Met Office, Scotland has been subject to an intense area of low pressure, bringing howling, raging south-westerly winds and torrential driving rain. 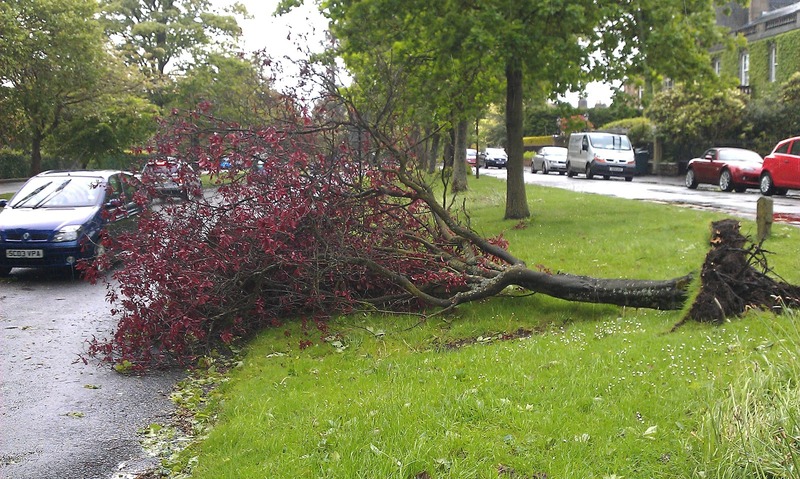 The Met Office ‘s amber-rated Weather warning predicted winds gusting up to 80 miles per hour. In fact, In Glen Ogle, 25 miles or so north-west of Stirling, on the road to Crianlarich and Oban, a gust speed of 100 mph was recorded. 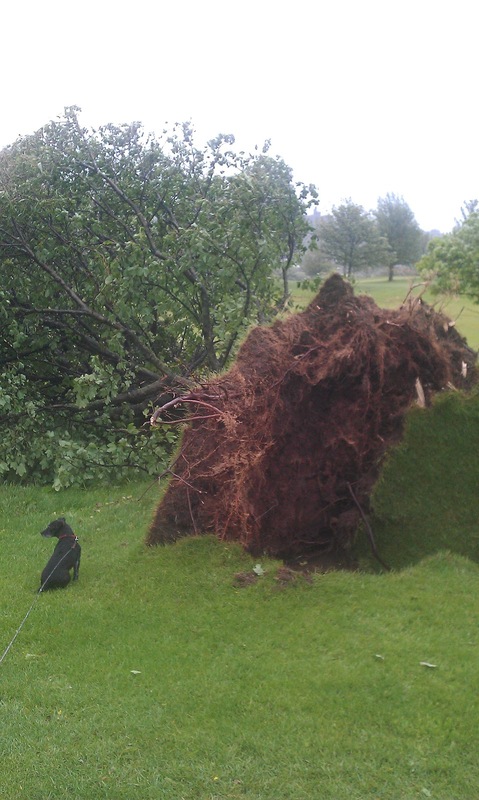 Such high winds in late Spring or Summer are bad news as regards damage to trees and gardens. 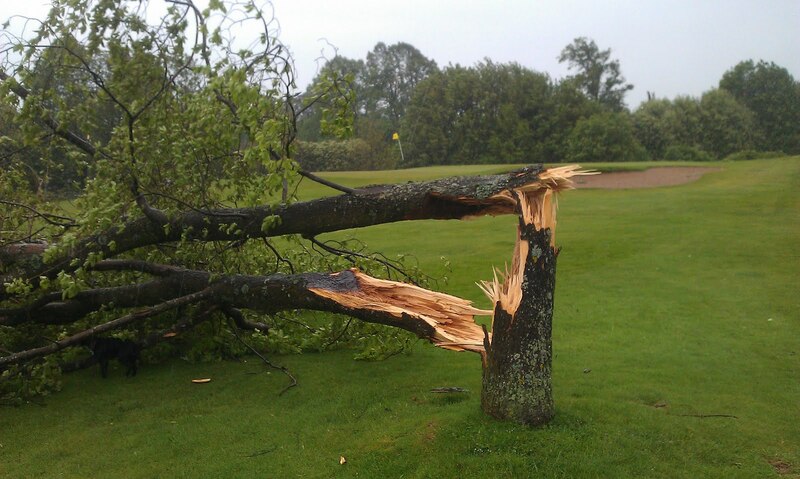 Deciduous trees are carrying their full complement of new leaves by this time of year, increasing the resistance to high winds and greatly increasing, therefore, the strain placed on branches. 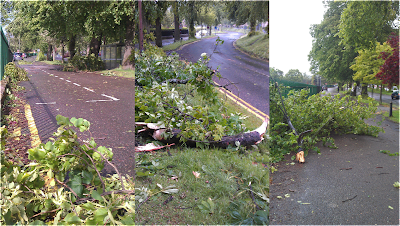 And so, not surprisingly, there were many examples of broken branches and even uprooted trees here in Stirling today. I was on holiday and took a walk around this afternoon recording the scene. Everywhere was littered with small branches, leaves, even some major tree branches. Many trees were also pushed over by extreme gusts. This poplar tree fell over behind me with a soft crash while I was sheltering from an extreme gust, waiting until I judged it safe to walk under a big lime tree that had already lost some big branches. I like the way the root plate, the outline of the branches and Stirling Castle in the background mirror each other’s shape in this case. 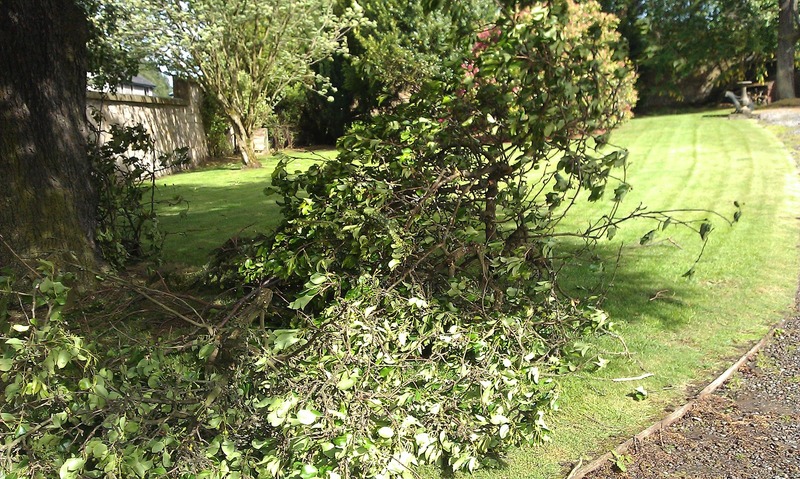 Our garden didn’t escape the damage either – here are the sad remains of half of our 150 year-old pear tree which snapped clean off in the wind. And our neighbour’s old (50 years old? 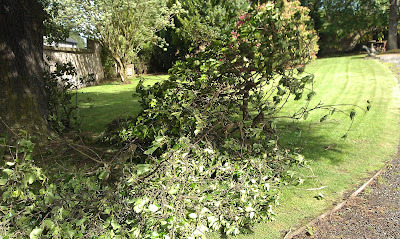 ), highly prolific bramley apple tree was simply pushed right over. So, no more free bramleys for us. A lot of fire wood available now! Thankfully my old pear tree survived unscathed. I drove into Edinburgh last night to pick up G as the trains had all been cancelled. The roads were almost completely deserted and the wind at the bridge on the A1 at Hailes was horrendous.